I was sad to see Casey Lane’s gastropub, Parish close last year, because it was a fun spot to gather with friends in downtown LA. Guests walked upstairs to the main dining area to order Lane’s grilled 16 oz. Niman Ranch, bone-in, beef rib-eye marinated in a chimichurri sauce with warm caramelized figs. The waitstaff sure built up their leg muscles walking up and down the stairs from the kitchen to the dining room. The beautiful, two-story Flatiron building didn’t stay vacant for too long, at the corner of Spring and Main. The owners of Hollywood’s New Orleans-style bar and restaurant, FiveOFour, Joshua Kopel and Mark Egland took over the building and made some renovations. They hired Rebel Design Group known for their innovative hospitality work. Downstairs they created a lively bar serving frozen slush-style daiquiri machines, Punch bowls that serve four to six guests with flavors that include lemon smash, blackberry honey sour and drunken watermelon. Guests walk up to the counter for creative cocktail service and stay to socialize with friends and other guests. Upstairs is another bar and sit down table service. The decor is a little New Orleans and a little Restoration Hardware. Wood floors below white paned floor to ceiling windows. Black banquette seating with white walls and boxed mirrors decorate the room. The ceiling is exposed with electrical wiring and wood beams. 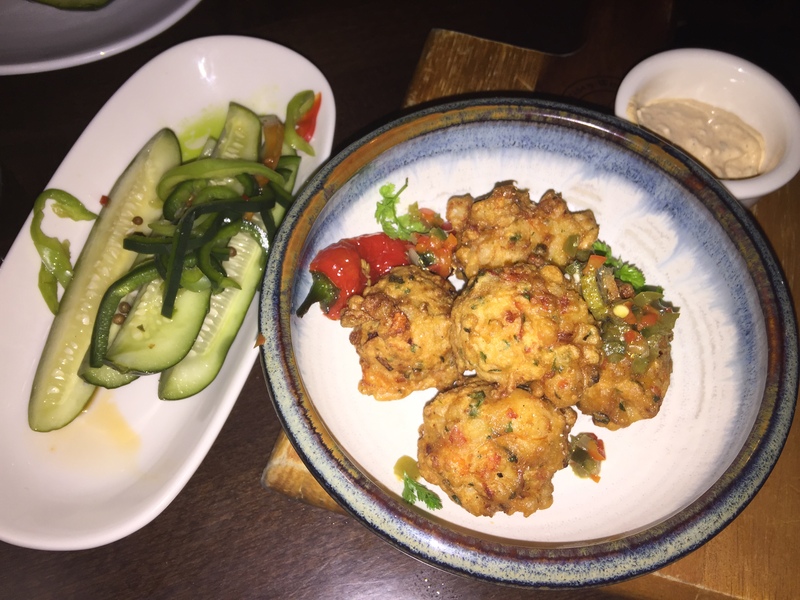 Honoring New Orleans cuisine, the owners of Preux & Proper hired the talented chef Michael Ruiz, who cooked at Cobras & Matadors and the Morrison in Atwater Village. Both Kopel and Egland didn’t like the idea of servers and busboys running up and down the stairs with hot plates and empty dishes. They felt it created an accident bound to happen, so they took installed two dumbwaiters to deliver Ruiz’s food from the kitchen up to the second floor oyster bar area in seconds. Looking over the menu, we met our delightful server Jessica. I started my NOLA culinary adventure with a mint julep daiquiri served in a white Styrofoam cup with a straw. It wasn’t too sweet and very refreshing. 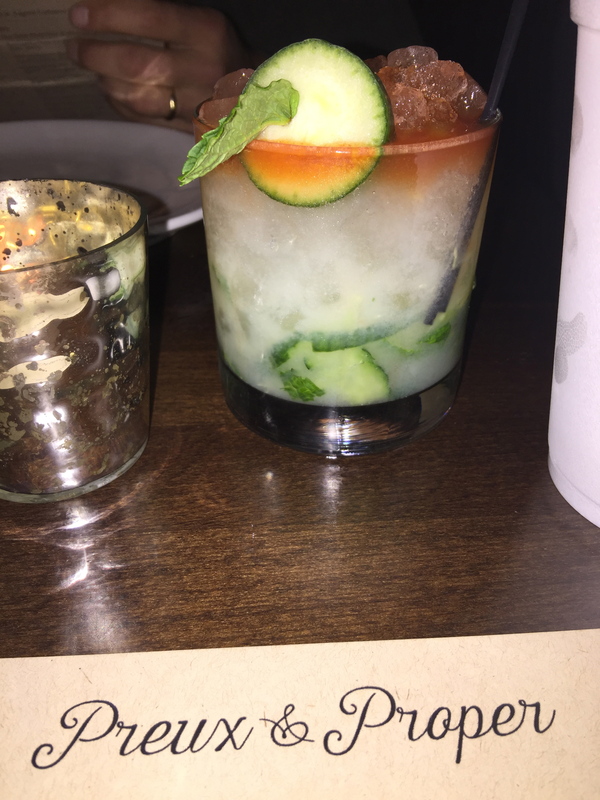 My husband sipped the pretty West Side cocktail with Grey Goose vodka, lime, Orgeat, cucumber, mint and angostura bitters. Both went well with the lightly fried smoked shrimp beignets served with a preserved lemon tartar sauce. They were filled with lot’s of shrimp pieces and fun to pop in our mouth. On the share plates section they also offer a muffaletta board with cured meats, cheese, olive, fig jam and grilled bread. Guests get to make their own muffaletta creation. Couples sitting near us were drinking moonshine-based cocktails, while enjoying crispy frog legs with chilies and coriander seeds, and a dish called debris hash brisket with belly potatoes and a bacon-onion jam with a soft egg. The duo sitting right next to us remarked that the crab cakes had too much homny and crispy black corn and not enough crab flavor. Of course this New Orleans-style restaurant has Po’ Boys. 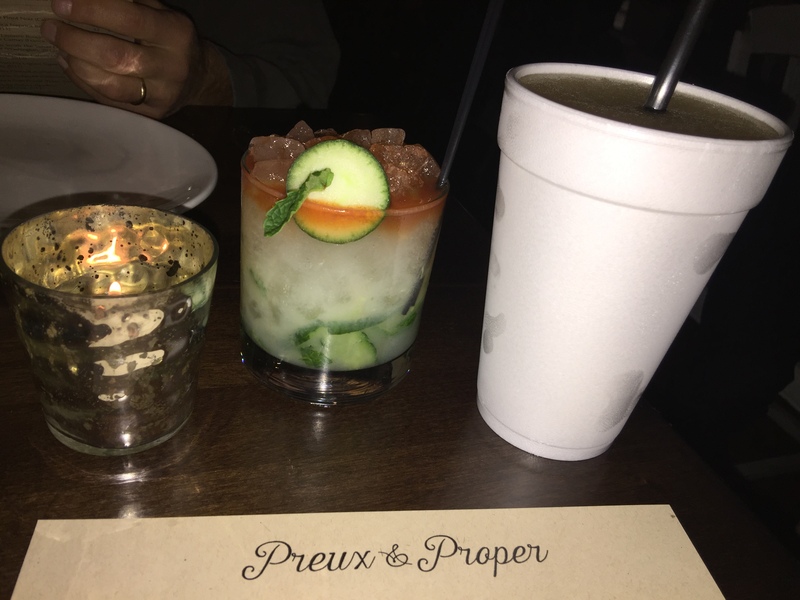 At Preux & Proper, they have a fried oyster Po’ Boy and lobster Po’ Boy. 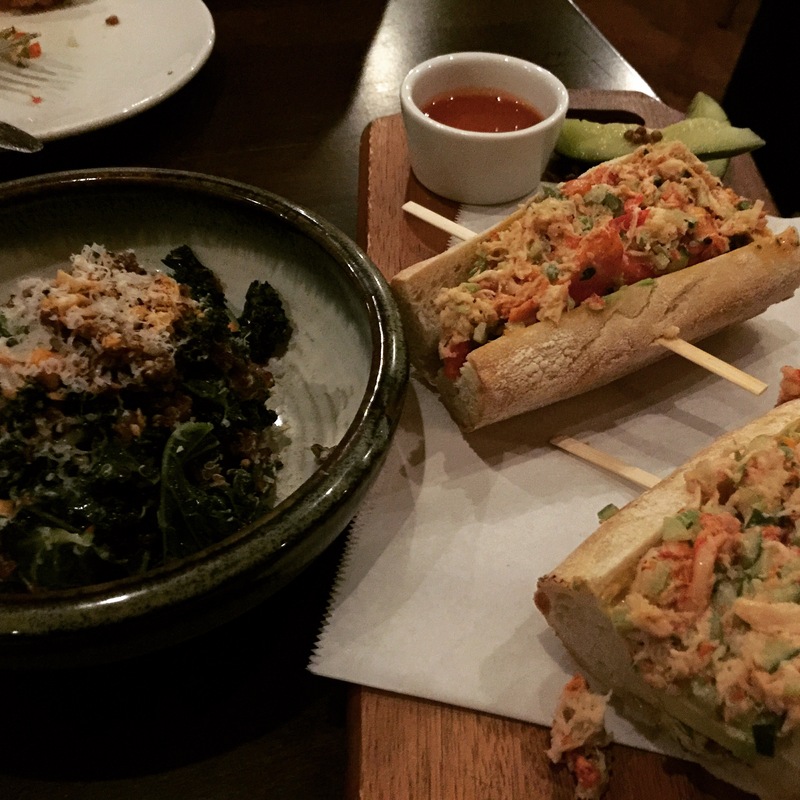 We selected the lobster served on a Bread Bar bun. It lacked big hunks of lobster and was more like a smoother lobster salad with a avocado-remoulade with a touch of hot sauce. Almost everything on the menu goes well with the slightly sweet and tart pickles with sliced red peppers. The also make crunchy Cajun corn nuts that offer a kick and go well with cold craft beer. My favorite dish was the heavenly warm kale and quinoa with shaved parmesan, chopped almonds and a dazzle of sherry. It was delicious. We ended the evening with a satisfying slice of pecan pie bar with with Jameson ice cream. Jessica told us the owners want to bring more of the excitement of Bourbon Street nightlife to downtown L.A. with themed events and music. They are hoping to attract Saints fans during football seasons. The restaurant opens at 4 p.m. daily for happy hour and dinner service begins at 6 to 11 p.m. The bars stay open until 2 a.m. daily. Chef Mike Ruiz is planning lunch and weekend brunch service to be offered soon. $$ 840 S. Spring St. (213)896-0090. This article was published in the February 18, 2015 issue of the Beverly Press and Park LaBrea News.